African Fusion talks to Nahanni Nagle, regional manager of Lincoln Electric sub-Saharan Africa, about welding automation and how to go about making appropriate choices from a welding perspective. Column and boom installations are ideal for applications involving large parts with long welds. In welding automation, you often get a sense that the robot suppliers think only about robot solutions and the column and boom manufacturers think only about column and boom solutions – and neither give proper regard to the right choices,” begins Nagle. “I like to think that we are a little different, in that we start from the welding perspective. When we look at a job, we focus on the right welding approach – the right process and welding technologies – and only then do we look at automation. The first people we send in to look at an automation possibility are not automation specialists, they are welding specialists, who are able to recommend the best welding solution and to properly assess whether welding automation is feasible,” he says. The first decision that needs to be made on examining the feasibility of an automation solutions, is whether hard-automation or flexible automation is more appropriate. “Hard-automation solutions include the likes of columns, booms and rotators, combined in systems that are not easy to reconfigure.” Flexible automation is mostly about robots, “because you can reprogram a robot relatively easily ,” Nagle explains. 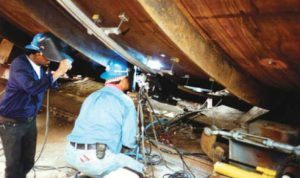 The big differentiator between a BUG-O type system and a fixed installation such as a column and boom, is usually the scale in terms of the number of parts required and the regularity of the welding. “If you have to make girders all day, it probably makes more sense to go for a fixed installation like a column and boom, but if you expect to have to make four girders before having to move onto something else, then BUGO makes sense – it is much more flexible and perhaps fits more comfortably into the flexible automation category,” Nagle tells African Fusion. Lincoln has several options for customers seeking column and boom installations and systems, he continues: “We can provide a full Lincoln turnkey system in conjunction with worldwide and local strategic partners to give the end users single source responsibility. We can integrate rotators and column and boom systems with seam tracking, arclength control and all of that,” he adds. Depending on the accuracy required, the tooling can get very complex and very expensive. In the automotive industry for example, tooling must be custom made, heat treated to remove any stress and all of the holding surfaces have to machined so that the robot knows exactly where the parts are, explains Nagle. They also want the robot to be welding all the time, so typically, the clamping is automated using pneumatically controlled clamps, so that as soon as the welding finishes, the table turns around, the clamps open, the operator removes the part and then reloads the jig. BUG-O systems – possibly the simplest and the least costly way to automate a welding process. A magnetic BUG-O track is attached along a joint to be welded. All positional welding is possible and weave features are available. Lincoln has a global partnership with Fanuc Ltd, the world’s largest supplier of robots, which involves the technical integration of Fanuc’s robot controller with the digital output of Lincoln’s software driven welding machines. “Locally, we team up with Fanuc Robotics, South Africa, and a specialist robotic integrator, Robotic Innovations,” says Nagle. “If we think that a welding application is suitable for robot automation, then we will call in Robotic Innovations to handle the integration of the welding equipment, the robot and the jigging,” Nagle explains. They have a very clever approach to flexible jigging. For each different part and its associated jig, they also attach a box of electronics – a unique identifier – that, when plugged in, will automatically select the correct programme for the part to be welded. The robot automatically recognises the jig and the part, making it very easy to change over between batch production runs and offering the flexibility to run a large number of different parts using the same robot. 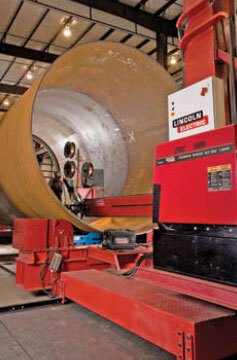 Lincoln can bring much more than a robot arm to the welding table, says Nagle. 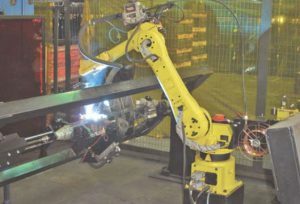 “We start with the right welding solution, which we then try to automate – using a BUG-O system or a turnkey installation or an integrated Fanuc-Lincoln robotic welding system. If a manufacturer has separate suppliers for welding equipment, robot arms, manipulators and consumables, they can all point fingers in different directions when problems arise, but if you use a whole-solution supplier then there will be very little opportunity to deflect responsibility.